Compressor(s) 180 hp. Recirculation pump 30 hp (only one). Glycol. Rink change area: Rebuilt in 2014. The changeroom area is bright and pleasant. There are windows facing the rink, unfortunately covered with a tight metal mesh, giving it a bit of a 'project' look. But at least the skaters/parents can look out to see the rink, and light comes in. There is a new window in the door of the adjacent staff office, so the staff no longer have to keep the door propped open to watch what's going on. Staff: Quite a bit of turnover lately, because of organizational restructuring. 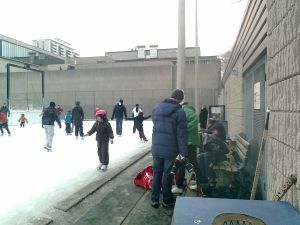 Community rink -- very popular, with good staff connections in the past. Comments about this rink: e-mail us at [email protected]. The Lawrence Park Athletic Association runs part of its kids' hockey program at Hodgson Rink (also some at Glen Long, some at Otter Creek). Community Skating Party with Josh Matlow, Rob Oliphant & Carolyn Bennett! I'm excited to be co-hosting a community skating party with our local MPs, Rob Oliphant and Carolyn Bennett at Hodgson Ice Rink (East of Mt. Pleasant, entrance off Millwood/Harwood, behind Hodgson PS). Please join us from 2pm to 4pm on Sunday, February 4th for a fun, family-friendly afternoon with free coffee and hot chocolate. From Ward 22 City Councillor Josh Matlow: "I am pleased that the 2016/17 skating year will once again feature expanded community hours at Hodgson ice. The agreement with the TDSB reached last year will see the rink open for community hours starting at 11:30am (rather than 4:30pm) every weekday." Closed for the season today, although it was scheduled to stay open until March 20. From 1pm to 3pm on Sunday, February 7 for a fun, family-friendly afternoon with free coffee and hot chocolate. Expanded Community Hours for Hodgson Rink! I am happy to report that we have finally been successful in expanding community hours at Hodgson ice rink. While we were successful at getting a new rink built, there were many of us who weren't satisfied with the relatively few hours initially dedicated to the community. 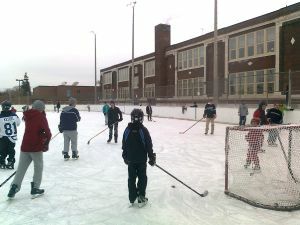 Since the new rink opened, the school has had exclusive access until 4:30pm every weekday, even though it is not fully utilized. Today, the TDSB has finally signed off on our proposal to expand hours for community ice time. The new agreement will see the rink open for community hours starting at 11:30am (rather than 4:30pm) every weekday. City Staff have told me that they expect the new, expanded hours will start within a couple of weeks. I'm grateful to Trustee Shelley Laskin for her strong support and assistance. I have also asked City Staff to update, the very out-of-date, rink website as soon as the changes are operational. For the skating schedule, go to Hodgson Rink page on the City website, then click on Skating. There is a hot chocolate machine that works, but no other food. The women's washroom appears to be a hallway between the main change area and the office. Helmets: strictly enforced for children under 6. The rubber mats in the changeroom only go far enough to reach the first few spots on the benches, leaving most of the changeroom unavailable to people without skateguards.